Mil 26482 circular connectors are a family of miniature connectors with minimal weight featuring a quick release three-point bayonet. 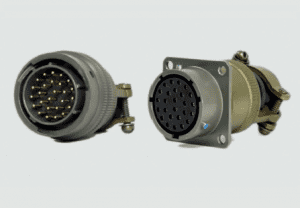 Available as MIL-DTL-26482, Pattern 105 and Pattern 602 for use in demanding and rugged applications such as military and commercial, especially where a higher contact density connector is required. Two series are available, one compatible with VG 95328 and the other with standard accessory threads. The receptacles are hermetically sealed to provide a moisture barrier in bulkhead applications. Contact our unbiased specialists today. We can advise and supply from a number of our trusted OEM suppliers. Body features standard military threads allowing application of a broad range of standard endbells and accessories. 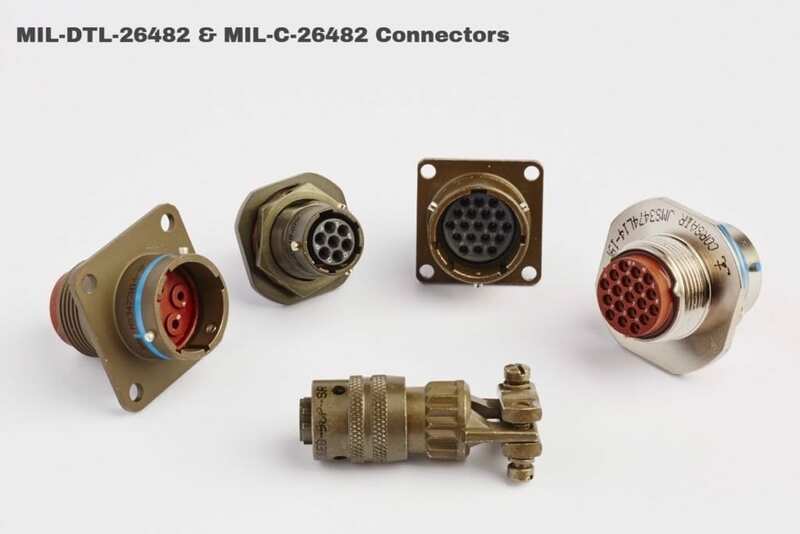 MIL-DTL-26482 military connectors are also available in commercial variants and are commonly used in applications where higher density contacts are required in harsh environments. Select the Series II variants for the broadest range of accessories, which NYK Component Solutions will be happy to advise upon and supply. The connector is available in two series with both solder and crimp contacts. Select the right part ordering system. How and where will this connector be used? Select your Shell Style. What environment will this connector be used in? Select your Service Class. What is your electrical requirement? Define your Shell Size, this will be dictated by your circuit demands so, therefore, your Contact Arrangement. See the insert configuration by shell size tables. Which half of your circuit is active? This will define your Contact Style, i.e. whether your connector should have Pins or Sockets. Do you need to prevent mismating with similar neighbour connectors? Define if your connector needs a Polarising Position. Finally, what Finish do you want your connector body to be? The tables below will assist you to construct an official MIL spec part number. 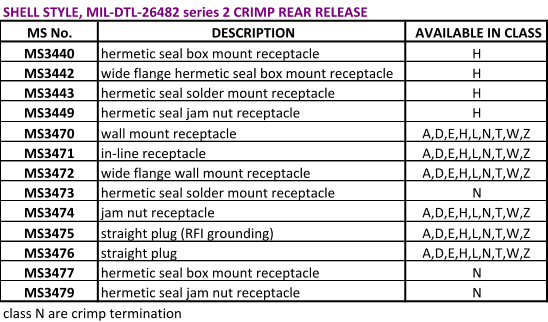 Many of the connector OEM’s have their own proprietary part numbers which we can cross-reference to from the Mil part numbers. NYKCS are distributors for the industry-leading connector OEM’s and we can provide unbiased advice for you to meet your technical and logistical requirements. For insert arrangements, number of contacts and polarisation options please see the MIL-DTL-26482 INSERT CONFIGURATIONS by SHELL SIZE tables page. We provide a full range of compatible accessories.